Archaeologists assume that cranes were used in Greece since 900 BC (although there is no direct proof). After a recent discovery of a 2.3 ton and 2900 years old sarcophagus in Corinth an archaeologist (Guy Sanders) said: “To lower the sarcophagus into place in a controlled movement … requires some kind of temporary superstructure over the grounds so they can control the vertical movement of the stone”. 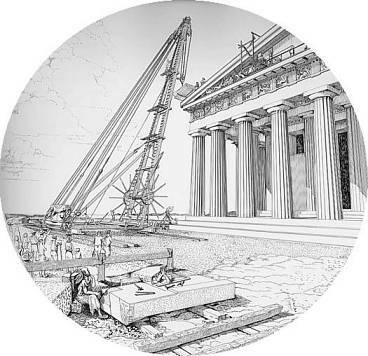 or temples (according to Vitruvius Greek Cranes could lift 6 tons, The columns were build by parts, so-called column drums, with a weight each more than 1 ton. This was very helpful for my school paper thank you. Although, I think you should find more and add it to the little amount of facts you already have. There is more information out there on Greek Cranes. I add to it when more information comes in I am glad you like the site and most of all that is was helpful in your studies.